Mohammed Abouhalima. [Source: Corbis]Siddig Siddig Ali, Abdo Mohammed Haggag, Abu Ubaidah Yahya, Mohammed Abouhalima, and others train at a militant training camp in New Bloomfield, Pennsylvania, with weapons and ammunition provided by Yahya and Clement Rodney Hampton-El (see February 21, 1995). Abouhalima will later be convicted for a role in the 1993 WTC bombing, as will his brother (see February 26, 1993) while the others mentioned will be convicted for roles in the related “Landmarks” plot (see June 24, 1993). [USA v. Omar Ahmad Ali Abdel-Rahman et al, 7/13/1995, pp. 9] Yahya is the chief instructor, as he is an ex-US Marine who served two tours in Vietnam and teaches at a martial arts academy. Siddig Ali will later say of Yahya, “[H]e’s decorated and has a lot of medals… [and he was] a great trainer…” The training even includes mock nighttime assaults on a nearby electric power substation. [Kohlmann, 2004, pp. 73] An FBI informant named Garrett Wilson helps lead the FBI to the camp, and the FBI monitors it for two days, January 16 and 17, but the monitoring team is mysteriously pulled away before the end of the second day (see January 16-17, 1993). In a wiretapped conversation with an FBI informant (most likely Wilson), Siddig Ali says regarding the camp, “Our goal is that these people get extensive and very, very, very good training, so that we can get started at anyplace where jihad (holy war) is needed… And after they receive their training, they go to Bosnia… And whoever survives, I mean, could come and [instruct] somewhere else, or Egypt, or any other place, etc…” [Kohlmann, 2004, pp. 73] Hampton-El makes trips to Europe to pick up money from the Third World Relief Agency (TWRA) charity front to fund the camp (see Late 1992-Early 1993). TWRA is funneling huge amounts of weapons into Bosnia in violation of a UN embargo but with the tacit approval of the US (see Mid-1991-1996). 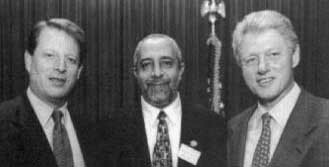 On January 15, 1993, FBI informant Garrett Wilson had led the FBI to a meeting attended by Abu Ubaidah Yahya, Abdo Mohammed Haggag, and Siddig Siddig Ali (see January 15, 1993). Yahya is security chief for the Al-Kifah Refugee Center, a charity front tied to both al-Qaeda and the CIA (see 1986-1993), and Haggag and Siddig Ali both work with the “Blind Sheikh,” Sheikh Omar Abdul-Rahman, who is also closely linked to Al-Kifah. Suspecting a violent plot, FBI agents have a plan to continuously monitor Yahya, Haggag, and Ali from when they leave the meeting, and for the next couple of days that is what they do. On January 16, Yahya leads the FBI to Jersey City, New Jersey, where he is holding exercises for a group of Sudanese and Middle Eastern men. Then the FBI follows Yahya and this group he is leading to a militant training camp on a farm in New Bloomfield, Pennsylvania. A squad of investigators watch them practicing martial arts, sniper firing, and rappelling. The agents think that they recognize one of the trainees as Mahmud Abouhalima, who they already strongly suspect was involved in the 1990 assassination of a Jewish leader (see November 5, 1990). (In fact, the trainee is his brother Mohammed - both of them are tall and red-headed.) However, on January 17, FBI supervisor Carson Dunbar calls the squad away from the training camp, preventing them from following the suspects as they return to their homes that evening. The FBI squad is upset, as they are sure following the suspects to their homes would lead to many new identifications and leads. Dunbar claims the surveillance is costing too much money and effectively shuts down further surveillance of everyone but Yahya and Clement Rodney Hampton-El, who has been working with Yahya, and only when they’re in close range of the FBI New York office. [Miller, Stone, and Mitchell, 2002, pp. 90-91] Yahya will continue to train his group at the Pennsylvania camp through early February (see December 1992-Early February 1993), but apparently without further FBI surveillance of them.